Название альбома: Standards: What Are You Doing the Rest of Your Life? 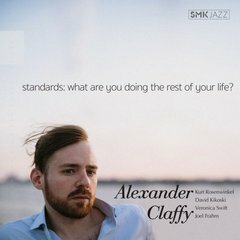 Bassist, Alexander Claffy Puts a Modern Spin on Timeless Classics with a Generations-Spanning Album, “Standards: What Are You Doing the Rest of Your Life?” Claffy will feature music from his new recording during his debut performance at Scullers. Due out November 2, 2018 via SMK Jazz, Claffy’s first straight-ahead jazz release features key influences and mentors Kurt Rosenwinkel, Dave Kikoski and Joel Frahm along with an ensemble of rising star peers. Since arriving in NYC, Claffy has worked with a staggering array of artists spanning generations and styles: elders like Jimmy Cobb, Louis Hayes, George Coleman and Harold Mabern as well as modern and rising stars including Christian Scott, Roy Hargrove, Jeremy Pelt, Chris Botti and Joey Alexander. He’s also an in-demand member of a game-changing generation that includes many of his guests on What Are You Doing the Rest of Your Life? along with the likes of Sullivan Forter, Emmet Cohen and lifelong friend Justin Faulkner.